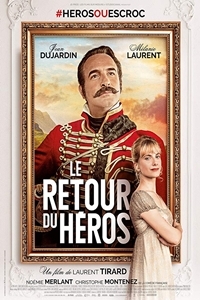 Sorry, but Return of the Hero (Le retour du héros) is either started or over at Alhambra - Keswick. France 1809. The charming Captain Neuville is set to marry the nai¨ve Pauline when the war breaks out, forcing Neuville to depart for the battlefield. After not hearing from the captain for months, Pauline soon starts to become ill with worry, pushing her sister Elizabeth to write fake letters on behalf of Neuville thinking he would never come back.When Neuville finally returns home unexpectedly, he is welcomed in glory but in truth is a war deserter and an opportunistic coward. A suspicious Elizabeth is determined to expose the real Neuville and the two imposters are about to start a ruthless fight, conspiring against each other using the best tricks they can find. Suitable for 12 years and overFilms classified 12A and video works classified 12 contain material that is not generally suitable for children aged under 12. No one younger than 12 may see a 12A film in a cinema unless accompanied by an adult. Adults planning to take a child under 12 to view a 12A film should consider whether the film is suitable for that child. To help them decide, we recommend that they check the Ratings info for that film in advance. No one younger than 12 may rent or buy a 12 rated video work. Sign up for updatesKeswick Alhambra will add your email to their marketing mailing list.